Pathologist Philippe Charlier looks at the skull of Agnes Sorel, French King Charles VII's lover, in 2004. With powerful microscopes and hi-tech diagnostics that tease out chemical signatures and DNA telltales, Charlier pores over centuries-old remains to probe the riddles of history. The French media like to call him the "Indiana Jones of the graveyards", but perhaps a better tag would be the Sherlock Holmes of forensic science. With powerful microscopes and hi-tech diagnostics that tease out chemical signatures and DNA telltales, pathologist Philippe Charlier pores over centuries-old remains to probe the riddles of history. He has determined that Vatican-authenticated bone fragments said to have come from Joan of Arc were in fact from a cat and an Egyptian mummy. He has confirmed that a mummified heart came from the uncrowned boy king Louis XVII. He has crushed the folklore that said Napoleon was poisoned to death by his perfidious English captors. And in Diane de Poitiers, the mistress of King Henri II of France, Charlier made the shocking discovery that the 66-year-old had drunk an elixir of gold in what was apparently a desperate bid to keep her youth. Now the scientist has turned his attentions to Richard the Lionheart, hoping to use what is left of his famous ticker to learn more about the legendary 12th century English monarch. Speaking to AFP at an exhibition on his work, Charlier referred to his ancient subjects as "patients" for which a forensic scientist gradually develops a doctor-like relationship. "One does tend to get attached," he said. Pathologist Philippe Charlier holds up the skull of Agnes Sorel, French King Charles VII's lover, in 2004. "Looking at it realistically, it's ugly," Charlier said of the mask, with its bulging forehead, small cheekbones and scrunched-up nose. Charlier used 3-D imaging of a preserved skull to bring to life the face of French King Charles VII's lover Agnes Sorel, the first woman in French history to hold the title of official mistress. She died at the age of 28 in 1450. But her death mask belied the pixie-like beauty for which she was famed in life. "Looking at it realistically, it's ugly," Charlier said of the mask, with its bulging forehead, small cheekbones and scrunched-up nose. The scientist's analysis determined that Sorel had died of poisoning with mercury, an important ingredient of medical salts of the era. Charlier's lab is at the University Hospital Raymond Poincare in Garches, south of Paris. 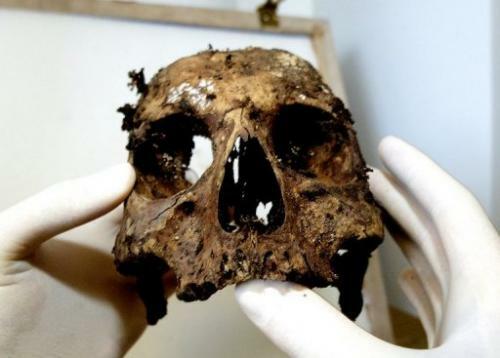 In 2010, it confirmed that a severed head long thought to belong to Henri IV, murdered in 1610 by a Catholic fanatic, was indeed his -- a finding that is disputed by some. Pathologist Philippe Charlier takes a piece of bone from an urn containing the remains of Agnes Sorel in 2004. Speaking to AFP at an exhibition on his work, Charlier referred to his ancient subjects as "patients" for which a forensic scientist gradually develops a doctor-like relationship. Henri's remains had been taken, along with those of other French nobles from their tombs in the royal chapel at Saint-Denis in 1793 by revolutionaries who tossed the remains in a pit. The scientist is now examining a small sample of the heart of Richard I, who ruled England from 1189 to his death in 1199, apparently from blood poisoning after he was shot with an arrow. Housed in the Gothic cathedral of Rouen, northern France, the relic comprises just a sprinkling of decomposed dust. Charlier has taken "one or two milligrams" of the precious remains and is carrying out chemical tests on them. The results are likely to be unveiled in the next three months, according to the French press. The goal is to find out more about 12th-century embalming -- the practise was carried out by barbers or even cooks -- and perhaps identify the germ that killed the warrior-king. "We know virtually nothing about the (embalming) techniques of that time," Charlier told the Parisien daily. "It is a forensic challenge. We want to get the maximum information from the smallest possible sample." Richard is often described in the schoolbooks as a pious leader, brave soldier and a dashing man of letters, but historians say this version masks a life of brutality, bloodshed and religious intolerance. He led the Third Crusade of the Christian world against Muslims who had captured Jerusalem in the 12th century. He died at the age of 42 after being shot with a crossbow during a siege of the castle of Chalus-Chabrol in the Limousin region.